Released on 16 April 2013 to mark the 60th anniversary of the launch of Her Majesty The Queen's world renowned ship HMY Britannia. 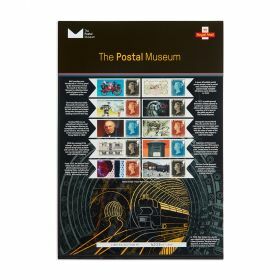 This striking sheet complements the stamps to be issued by Royal Mail on 30 May to celebrate the anniversary of Her Majesty's Coronation in 1953. Released on 16 April to mark the 60th anniversary of the launch of Her Majesty The Queen's world renowned ship HMY Britannia. This striking sheet complements the stamps to be issued by Royal Mail on 30 May to celebrate the anniversary of Her Majesty's Coronation in 1953. The sheet is packed full of fascinating facts, figures, stories and photos relating to the Royal Yacht - including its launch, historic ports of call and decommissioning on 11 December 1997. It also contains details of the design and specifications of the vessel that played a central role in The Queen's reign as she travelled across the world, welcoming monarchs, presidents, prime ministers and diplomats on board. Since 1998 Britannia has been permanently moored in the port of Leith in Scotland and has become an award-winning tourist attraction.